Pretty + Dangerous = Stinging Rose Caterpillar (Parasa indetermina). I had a devil of a time trying to ID the caterpillar, but ultimately found success through Google+ member Garden Experiments, who confirmed some of my own Internet research. 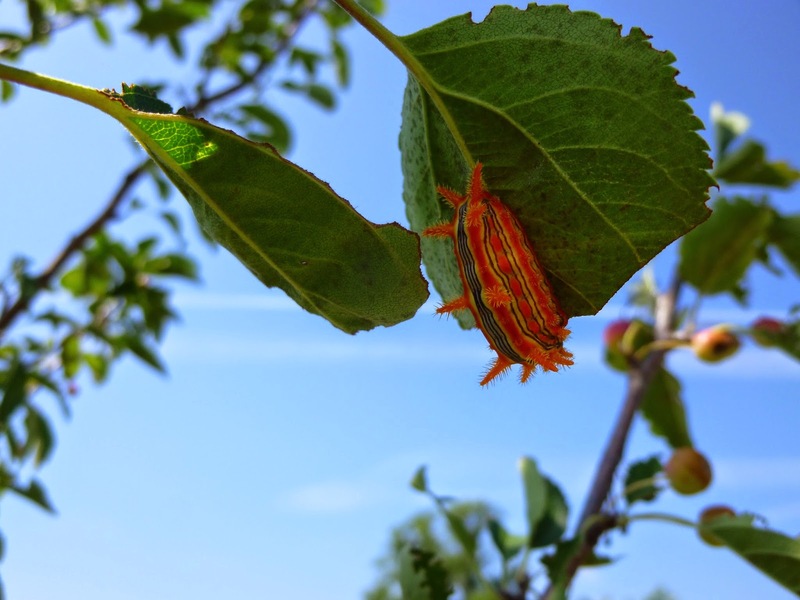 The Featured Creature blog has some great photos and description of this caterpillar. The University of Arkansas Arthropod Museum describes how the Stinging Rose can deliver a severe venomous punch through its spines to any creature foolish enough to attack it. The adult moth form of the Stinging Rose may not be as flamboyant as the caterpillar, but I think it has a soft, elegant beauty all its own. In 2005, the USDA noted that the Stinging Rose has been found in many Eastern and Midwestern states, but that it is "considered uncommon to rare" throughout its range and that "most states in its range contain only a few populations." So I feel very, very fortunate to have spotted a couple of these in my own backyard! As with many species, it seems that the Stinging Rose has suffered due to habitat loss caused by human land-use practices. One issue (if I'm reading the USDA report correctly) seems to be that caterpillars will overwinter in the leaf litter below a tree in forest settings. In a landscape situation like the one in my backyard, I don't see how the caterpillar will survive the winter since the tree is planted in the middle of a lawn. Not much leaf litter there. I suppose that gives me another reason to minimize the lawn and create more landscape beds of trees, shrubs and perennials were the leaf litter can be left to decompose naturally over the winter and into the spring, and where any overwintering moth larvae have a better chance of surviving to emerge as moths, lay their eggs and start this whole miraculous cycle once more.